Counting down towards the fiftieth birthday of Doctor Who with Fifty great scenes… This one’s from 2008 and 79AD, one of Doctor Who’s most visually stunning stories, set around a terrible disaster and a terrible choice. My favourite part has Phil Davis (back when he was merely serving the gods of the Underworld rather than the Devil himself) duelling with words and prophecies against a rival Soothsayer across a fantastic few minutes that transform from sit-com to mystery to impossible revelations, all directed like a breathless action scene. The Fires of Pompeii bowled me over when I first saw it, and for me it’s still one of the very best stories since the series returned to TV – and among the best across all fifty years. 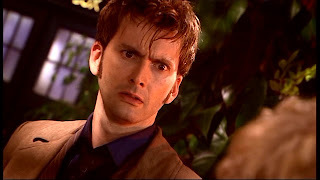 The most gripping scene has a lot in common with my favourite from Day of the Daleks: it’s built on stunning dialogue and revelations about time – though, here, it’s the beginning of the mystery and not the solution to it, so it’s not the Doctor working it all out but being caught out. And while in Day of the Daleks it was a relief that the drama was so intense because the big action scene following was such a let-down, here the whole episode looks bloody awesome, from shooting on borrowed Roman sets, to Vesuvius erupting, to flaming great monsters. Yet despite all that, the episode’s most brilliant scene is all dialogue, in one beautifully designed set that’s still just one room, and could have been just as spellbinding for any Doctor from William Hartnell (especially William Hartnell) on. It’s ten minutes in when the Doctor and Donna bluff their way in to meet Caecilius and his family, introducing themselves as Spartacus. And Spartacus (they’re not married). And the six minutes that follow in the atrium of Caecilius’ house are really three scenes in one, all moving so fast and so packed with ideas that I watched it over and over for weeks, thrilled every time. At first, it’s a funny sit-com of social climbers. 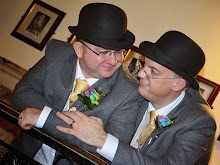 Caecilius mines, polishes and designs marble and, though they’re pretty well-off to start with, he’s anxious to make it big; his beautiful wife Metella (Tracey Childs) is getting everything ready for their important guest… But, oh no! Little earthquakes keep knocking over the showpieces, their very pretty son Quintus is lolling about drinking and bored, and now in come the marble inspectors at just the wrong time! What larks (served with larks’ tongues)! And of course we know the latter are really there to con them out of their expensive new piece of modern art. Or, at least, the Doctor is – it’s comedian Catherine Tate whose character suddenly brings the scene crashing out of comedy by urging them to leave the city, only to be hauled off by the Doctor for a quiet, fierce argument about the ethics of interference when people are about to be burned to death. The Doctor can’t resist interrupting with some clever wordplay of his own, but he can’t stand around embarrassing the Caeciliusus all day, not when there’s a perfect distraction to let him and a protesting Donna slope off to the TARDIS. And so they do… But the Doctor takes just one look back, and sees what Lucius has come for: Caecilius has sculpted a giant circuit to the Augur’s design. Made of stone. How did he dream that up two thousand years early? 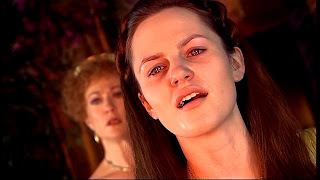 And as he explains the job of official superstition to Donna, talking quickly to cover his mind racing at what’s going on, Caecilius’ daughter Evelina (Francesca Fowler) enters and makes the situation stranger still. Pale, sweating, her right arm swathed in bandages, Evelina too looks pretty but ill – no, even before she totters towards them sneering and insulting people like a malicious drunk, she looks like she’s on something. And she is. Her ambitious mother’s had her consuming the vapours from underground, stimulating visions to win her a place in the Sibylline Sisterhood. 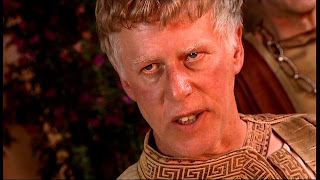 And now the focus suddenly shifts from the clever Doctor running rings round Caecilius or showing off with Lucius, and to a gripping face-off between Francesca Fowler and Phil Davis, the Doctor only important as something new they can strip impossible truths from. The duelling Soothsayers start low, as does the quietly ominous music as Evelina exposes the Doctor’s offhand mockery, which might just be a drunken daughter putting her foot in it – prompting another side to Quintus, distressed at her apparent illness, and to Lucius, sneering at a rival, and only a woman at that: “Only the menfolk have the capacity for true perception.” Donna lashes out at the sexism; the Doctor questions the “strength” the vapours have given Evelina. Evelina doesn’t appreciate it. “Is that so – man from Gallifrey? Everything comes together to make this long, talky scene utterly electrifying – and though I love Phil Davis really giving it some welly (and as the episode continues, he’s awesome as he dials it up his villainy with ‘I am in an old-fashioned Doctor Who and I will do some old-fashioned Doctor Who shouty acting!’), Francesca Fowler more than holds her own against him, both of them aided by Murray Gold’s score and Colin Teague’s direction. The Doctor sometimes deserves to be given a shock for showing off, and the escalating revelations slashing in at him from either side clearly leave him off balance. This early in the season, too, the prophecies for each of them still have a thrilling promise to them (Metebelis spider! Oh. Plastic beetle) that even now makes the hairs stand up on the back of my neck. Though there’s also one last comedy moment as Lucius puzzles out an unfamiliar prophetic word “Daughter of… London” in the thickest London accent of the season. But those are only competing prophecies in the same marketplace, selling the same future – Donna’s about to make a prophecy that’s a real challenge, and that’s when things get really dangerous… Though its most brilliant piece of messing about in history only comes in retrospect, when Donna – the Doctor’s last full-time companion before Amy – is dragged away by a sinister squad of Soothsayers led by one Karen Gillan. She really wants that job. The Doctor usually scoffs at soothsaying on principle, because it’s a con-job on the credulous. If it starts to come true, he only gets more cross – regarding it as some sort of con-job on time. Towards the end of Part One of The Masque of Mandragora there’s a great example of the former, before he notices that the latter’s creeping up on him, too. The Doctor (Tom Baker) has accidentally brought part of an intelligent alien energy force, the Mandragora Helix, to Earth, and in attempting to deal with it tries to warn Count Federico and his toadying court of the danger. On trying to express the concepts in Fifteenth-Century language, Federico takes him for an astrologer and summons his own, Hieronymous to test him. It’s a great, snappy exchange with all three impatient and none bothering to see the others’ points of view: Federico thinks the Doctor’s trying to con him (and he’s wrong); Hieronymous thinks the Doctor’s offending his beliefs (and he’s right, but only as an aside); the Doctor’s exasperated at wasting his time having to jump through hoops (and so recklessly intellectual and contemptuous of this nonsense that he forgets to persuade, and gets cut off).